There was a point in my life where, for four months, the only possessions I had were my backpack, a change of clothes, my makeup bag, and one guitar. It wasn’t by choice – I was a victim of excruciating circumstances I never could’ve imagined. But this is not about the circumstances; it’s about what I learned from the experience and how it helped me become who I am today and shape my view of things. You see, I’m a simple woman. I know what I want, and I know what kind of things make me happy. And guess what? The thing that makes me happiest is not an actual thing…Keep reading. For the record, I absolutely love things, both giving and receiving. I love shopping – window-shopping, actual shopping, online, in person, vintage shops, upscale stores, you name it. There’s nothing wrong with us liking things and acquiring them for the sake of living a happy, comfortable life. After all, we’re not here to suffer, deprive ourselves, and be miserable, right? Or how about someone who lets you borrow, but they impose a billion conditions and it’s painfully obvious they’re doing it half-heartedly, trembling with fear at the thought of parting ways with their inanimate object? How sad is that? These are possibly glaring symptoms of someone suffering from co-dependency to material items, fearing loss because they hoard to fill an emotional void. If they give, they feel they’ve lost control. They give conditionally, generally waiting for the moment you’ll repay the favor. And they won’t admit any of this. Let’s make something clear, though – nobody owes you anything; nobody is required to give you or let you borrow anything. However, I’m the type that finds it immensely rewarding to give to those who genuinely appreciate it, so here I simply offer my perspective and share what I’ve learned. 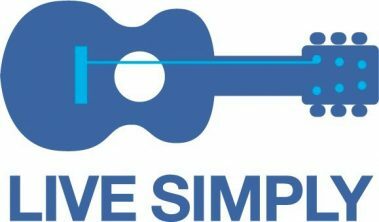 Living in survival mode and with the bare minimum taught me the power of simplicity. It gave me tremendous liberty. It taught me what I need to be alive, and that simplicity can’t be bought. It’s elegance, it’s freedom. 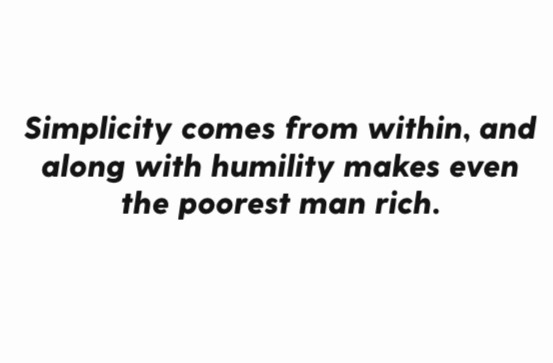 Simplicity comes from within, and along with humility makes even the poorest man rich. And definitely, things make us happy. They’re intended to make our time on Earth more practical, pleasant and enjoyable. We’re here to evolve, and we might as well have fun while we’re at it, no? As long as we don’t lose sight of our purpose. So the one thing that makes me the happiest above all is the liberating realization that I can live without things. I’ve lived through it. I found that the only exceptions to this “rule” are things to express ourselves, those things that function as an extension of you – guitar, journal, paintbrush, etc. If you’re fortunate, you’ll have a wake-up call, or like me, be the victim of circumstances. Generally these aren’t pretty, but they’re blessings in disguise… if you choose to see them that way. By letting go and gifting, you’re not only transferring happiness to someone else, you’re creating space for abundance for yourself – as long as you’re not doing it for the purpose of receiving. As I’ve said before, you get what you give, but don’t give to get. Give unconditionally and with zero regrets. And let me reiterate, we are meant to live happily. This is not about feeling guilty because you have a lot of things or because you love things. I’d be lying if I said I didn’t like things. I love things, especially really nice things. This is about detachment and placing value where it really belongs. Life is short – get the shoes, get the coffee. But don’t let them distract you from what matters the most – your loved ones, experiences, the simple joys– the type of things that money can’t buy. The things that will be with you the day that you die.